A new trike-style bicycle recently began circulating through Bossard Library’s popular Book-a-Bike program. Pictured, from left, are: Gallia County District Library Board of Trustees Elaine Armstrong (Vice President), Jay Caldwell, Library Director Debbie Saunders, Graham Woodyard, Traci Good, Larry Shong (Secretary), Robbie Jenkins (President), and O. O. McIntyre Park District Director Paul Covey. 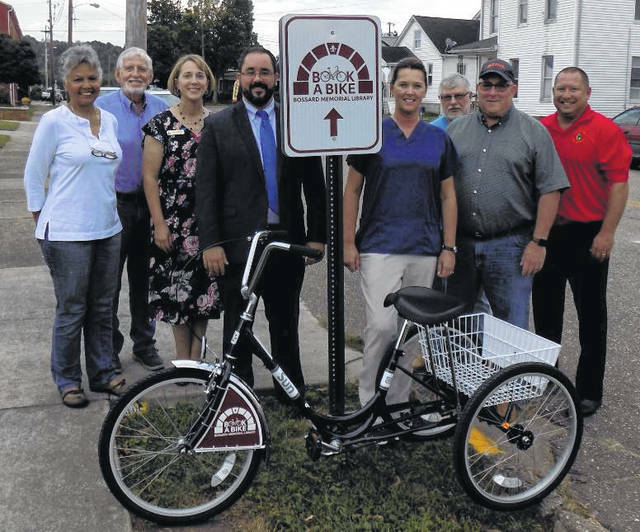 GALLIPOLIS – After receiving several requests for a trike-style (three-wheeled) bicycle, one of these popular bikes was recently added to Bossard Library’s “fleet” of Book-a-Bikes. Trike bikes allow individuals with balance issues who may otherwise not be capable of using a traditional two-wheeled bicycle to enjoy riding. “The library has had great success with the bicycle lending program. Therefore, we wanted to expand the program to meet the needs of patrons who have the need for a trike bike, which offers more stability for the rider,” Library Director Debbie Saunders said of the program. The trike bike will be added to Bossard’s fleet of 10 traditional-style bikes, with the stipulation that the three-wheeled bicycle can only be checked out by the same patron once per day. More trike bikes may be added to the collection, if a demand for them is noted. The Book-a-Bike program began in April 2016 and remains as a popular non-traditional collection at the library with a total of 102 check outs just in September. Those who check out Book-a-Bikes are encouraged to utilize the nearby Gallia County Hike and Bike Trail. Signs are located from the library along Spruce Street and will guide bikers to the entrance to the path near Spruce Street Extension. “We are pleased to be able to provide community members with the opportunity to borrow a bicycle. Given the close proximity of the bike path to the library, riding a bike on the trail is the perfect way to spend a fall afternoon,” Saunders said. Paul Covey, Director of the O. O. McIntyre Park District, encourages library patrons to utilize this program to take advantage of the hike and bike trail maintained by the park district, including an upcoming expansion to the current path. “The park district is looking forward to expanding the bike path from Farm Road to Mill Creek Road beginning next spring to early summer,” Covey reported. Library patrons in good standing who are over the age of 18 may borrow a bike for up to three hours at a time. Three bicycles can be borrowed on any one patron account and minors must be accompanied by a parent or legal guardian during the duration of the bike rental. Minors are also required to wear a bicycle helmet. For the full book-a-bike policy, please stop by the library or visit www.bossardlibrary.org/content/book-bike-policy.